Hi Wolfgang, yes you are right, I would like to have it further out, but I could not find a bolt long enough. But now I remember another hardware store selling long lengths of threaded steel, so maybe I can make my own latitude control bolt. I also have a tap and die set so I could make my own from scratch. But more time! I'm sure you'll find a solution! Wait for the result. There is no need for me to make a swivel base because there are bolt holes/slots in the tripod which will give me enough left/right movement. I had some issues getting it polar aligned, but I can confirm the polar option works on this ETX-80 telescope if you set it up as an ETX-70 with the #494 controller. This is a second hand scope and I discovered using my torpedo level, the declination circle had been moved by about 4 degrees, so Polaris wasn't showing up and this caused a few alignment failures. BUT...once I had it setup correctly, it tracks very well! Way better than in alt-az mode! 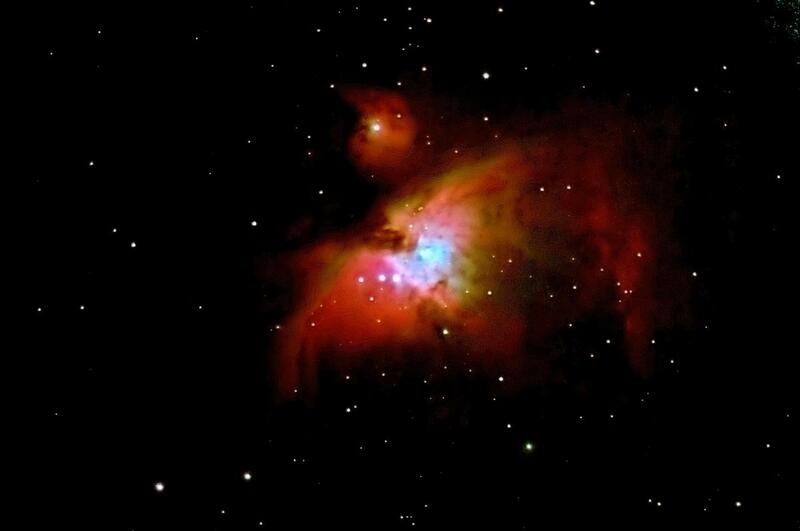 I had a 7mm eyepiece on the trapezium in M42 and it stayed in view for the half an hour that I was looking at it. Same with the Pleiades. I went inside, came out later and the stars in the centre were still there. Using the GOTO I hopped over to Capella, Aldebaran and Betelgeuse and it found them all in the 21mm eyepiece, just off centre. There was a small amount of drift, but I don't think it's perfectly polar aligned. It's also tracking very smoothly, it's not doing that jerky staircase motion that it does under alt-az mode. 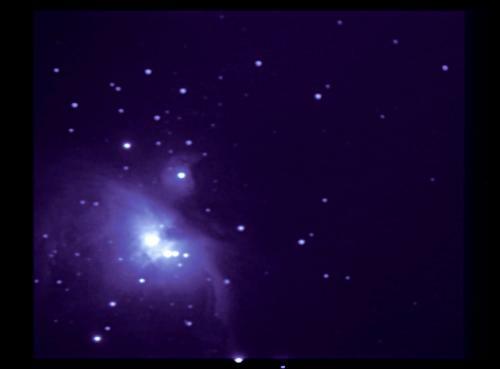 I've left it in sleep mode so I'll do some more observing and maybe some long exposure imaging tonight. So it's well worth the effort to make one of these. Even with my crude attempt, I'm very impressed so far! Congratulations on this very good work. I am pleased with you and that you are satisfied with their construction. True, polar alignment is critical for long-term observation or long-term exposure. I am looking forward to the first pictures with the EQ mode. Hopefully I can, before winter comes and brings the -30C temperatures! 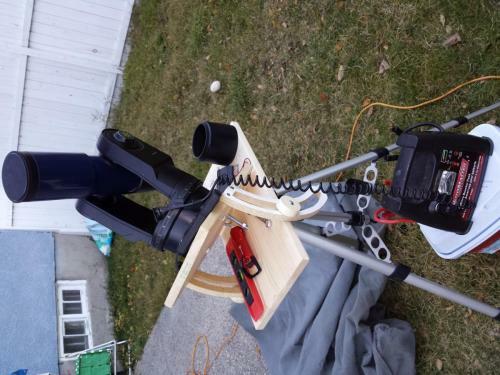 That is a really nice looking setup and it is good to hear how well the scope is working on equatorial mode! Once I get past some other work, I hope to do something like that for my scope. Thanks for taking the time to share your pictures and experience! Well, thanks for your suggestions. I've found the wedge useful as an extra tray to put things like some eye pieces, compass, level etc. 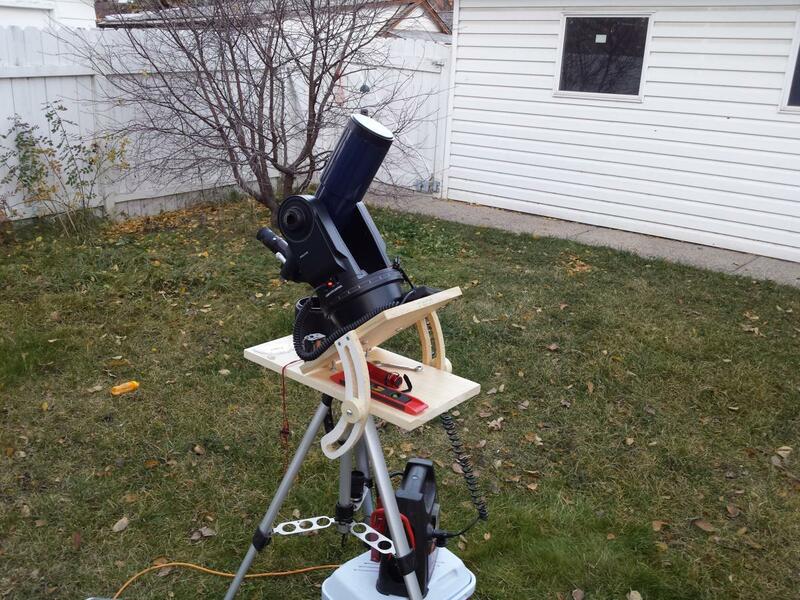 Here it is setup in the backyard. I hacked a car usb charger with a 9v pad and run it off a booster pack instead of AA batteries. It runs a million times better this way! wonderfully, I wish a lot of success with the Test's! If they want to see exact whether the object (e.g., a star) is exactly in the centre of the eyepiece and how long, then I recommend an eyepiece (illuminated) with a cross. With it I have gained good experience. Thanks for the suggestion, Wolfgang. I will add that to my Christmas list! Last night I used a 9mm eyepiece on the moon, and centred it on a crater. Left it for an hour, and it was still there, but it had drifted to the right. Then I fitted a 25mm eyepiece and viewed the Pleiades. I left it for 3.5 hours, came back and it was still in view, but again drifted to the right slightly. This is already SO much better than using the alt-az setup. OK. The truth comes only when they have an exposure over a longer period (2 minutes or longer). If then no trace of stars can be recognizable, then I can congratulate heartily. Had still found something to polar alignment. The illusion method is nevertheless very intensive and for me now and then incomprehensible. Perhaps here is a better method for an ETX described. Thanks for those tips, Wolfgang! Here's a very quick 'n dirty stack & process of 8 frames of M42, (luminance channel) each 20 sec exposures, taken with the DSI II. I think I've got about 70 frames to process in RGB, when I get the chance. The wedge setup holds the stars pretty steady, no smearing. Well, the beginning is made and I'm sure they will definitely make good pictures with the telescope. Furthermore good luck and fun. Here's a colour image of M42, 69 frames (23 RGB) stacked and processed, 20 second exposures. I'm encouraged. This is already better than I could achieve in alt-az mode. I did 30 second exposures of andromeda last night, but I'm not expecting great results thanks to the moon. But this is still a great chance to test the scope in EQ mode. It will always be better and then if exposures greater than 60sec become possible, then your results will always be better and more beautiful. I wish you continued success with the EQ mode. Here is a picture of M42 as I imagine this Orionnebel. That is a very nice image, Wolfgang!